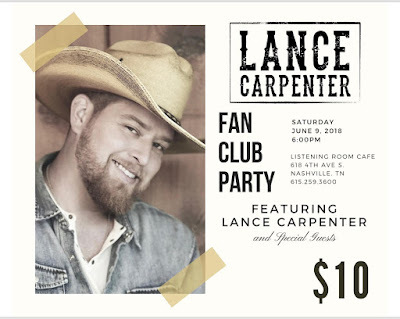 Lance Carpenter to Host Fan Party During #CMAFest! Lance Carpenter will be having a fan club party during the 2018 CMA Music Festival at the Listening Room Cafe on Saturday, June 9, 2018 at 6 PM. Tickets are on sale now for $10. Lance's current single "Anyone Else" is a duet with Krystal Keith.